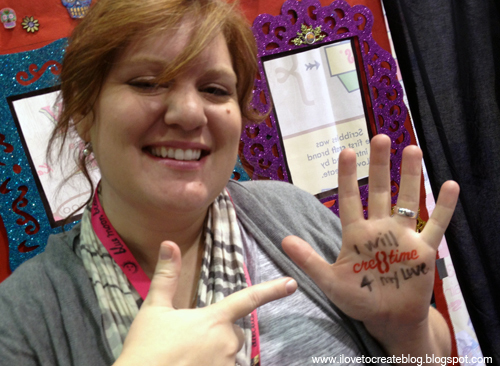 iLoveToCreate Blog: What will you Cre8time for? 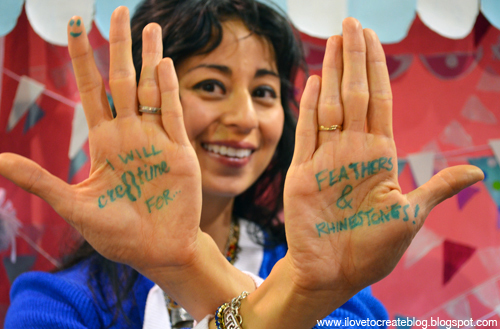 What will you Cre8time for? 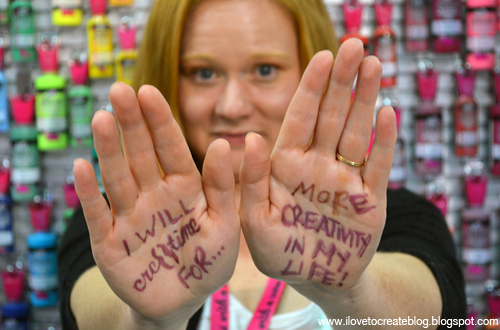 Last week, at the Craft and Hobby Association Tradeshow, we had a super fun time meeting with bloggers and designers and having them personalize their hands with our Tulip Body Art to help celebrate the launch of the Cre8time movement! 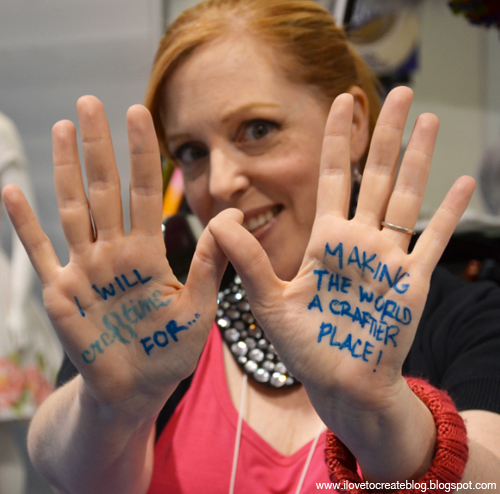 Our friend Margot Potter (above) obliged and is going to Cre8time for making the world a craftier place. Don't you just love that? What's Cre8time? 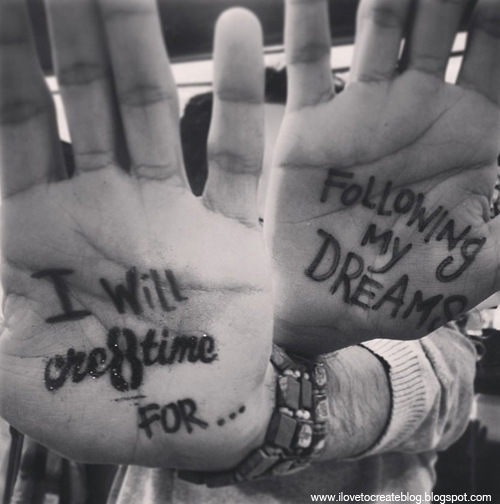 Cre8time is a creative movement for positive social change that let's people reclaim their creativity! It's designed to help people recover eight hours a month and devote it to their particular craft, and to create a place for them to share their experiences - the joys, lessons, and results – with the creative community at large! We could tell you more, but we think this video below does a nice job of explaining what the movement is all about! Now back to the fun we had with our craft and blogger friends! Our friend Angie from the Country Chic Cottage is going to add more creativity to her life! 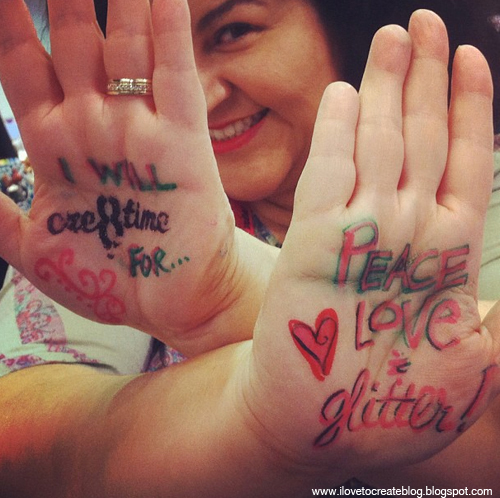 Crafty Chica Kathy Cano-Murillo is going to Cre8time more time for her motto "Peace, Love, & Glitter"
Jeshua, the Boi from Ipanema, is going to Cre8time for following his dreams in the year ahead! 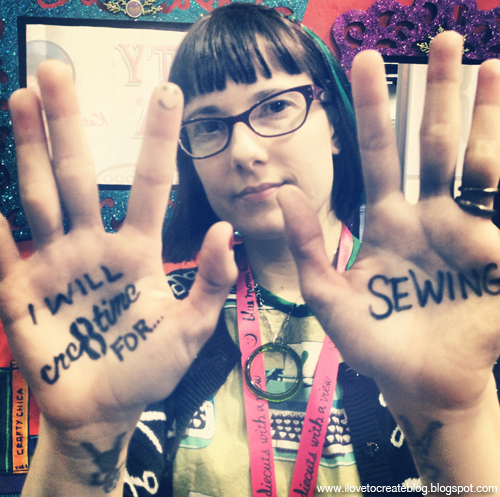 The Zen of Making's Haley Pierson-Cox is going to sew for the Cre8time movement. We've seen her amazing projects and think this is a great idea! 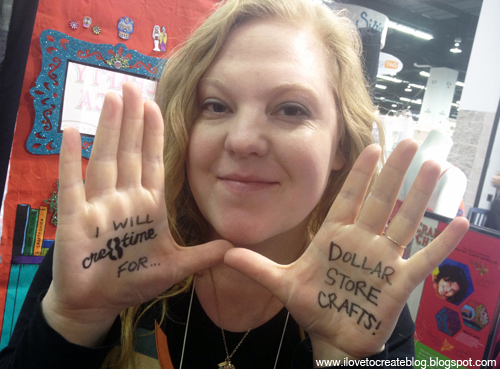 Blogger Heather Mann of Dollar Store Crafts is going to Cre8time for...you guessed it, DOLLAR STORE CRAFTS! Louisiana gal Jade Harrington of the Jaderbomb blog is going to work on developing her brand this year! We love Jen Hadfield's site, Tatertots and Jello, so it's great to see she's going to Cre8time for even more creativity in the upcoming year. Blogger and designer Jennifer Priest of Hydrangea Hippo is a paper maven, so crafting with paper is the perfect project for her to Cre8time for. 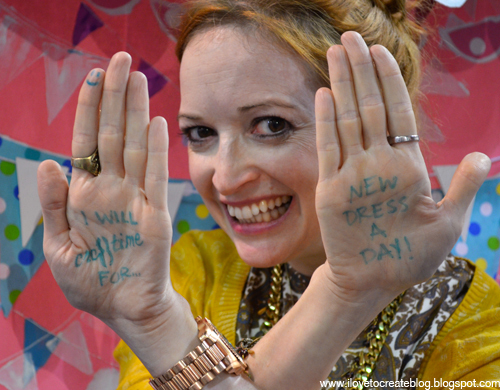 Blogger and author Marisa Lynch of New Dress a Day is spending more time to promoting her site and new book New Dress a Day. 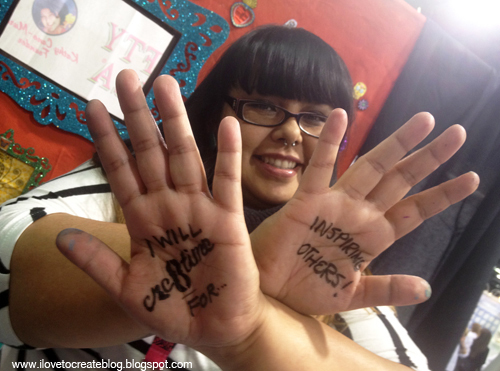 Denise of PearMama is giving back to others with her creativity by making it a point to inspire others! 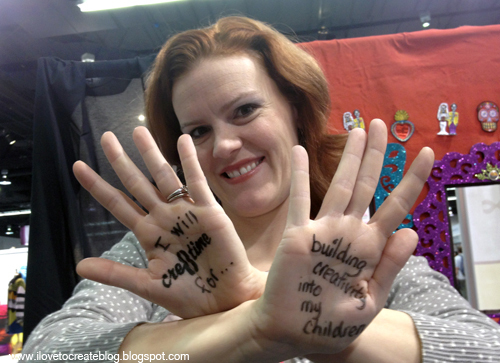 Beckie Farrant of Infarrantly Creative made the goal to build creativity into her children! So cool that she's instilling creativity in her kids. It's so important. 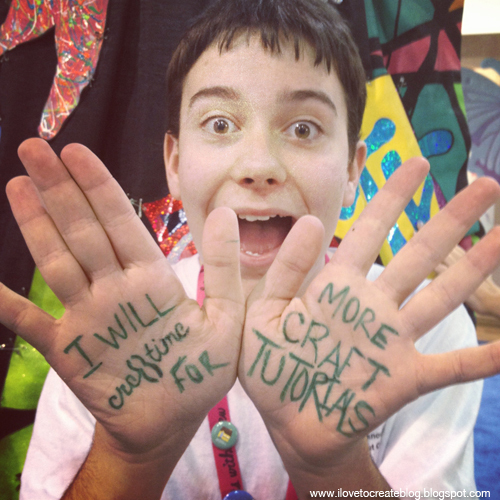 Tanner Bell of Tanner Bell Designs is going to work on more craft tutorials. We wanna take his advice on our own blog too. Designer and author Sonya Nimri is making more time for feathers and rhinestones. Sounds like fun to us! And Tauni Everett of the Snap Conference will Cre8time 4 her love. What's better than that goal? Let's give all our friends "a hand" (pun intended) for helping us out with this fun project. Now, go check out their sites and get insanely inspired to Cre8time for your own personal artistic passion. 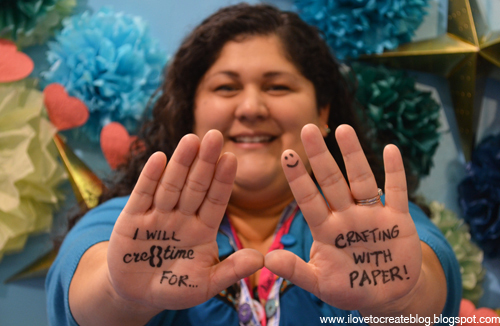 Now here's some fun ways for you to spread the word about the Cre8time movement! 1. 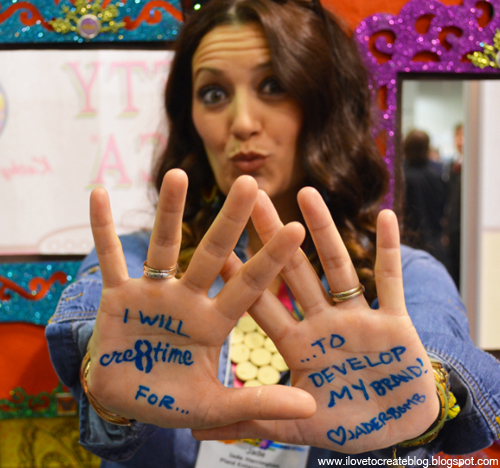 Make the Cre8time declaration on your hands and have someone snap a pic! Post your pic on the Cre8time Facebook page and on your own Facebook page wall. Instagram or blog it as well. And be sure to share the Cre8time.org web page with your friends when you show it off. 2. Cre8te a project and upload it to the Cre8time gallery. 3. Tell your friends and family about the movement and organize a family craft night. We can learn so much more about each other through creativity! It's super powerful. I love this idea!! 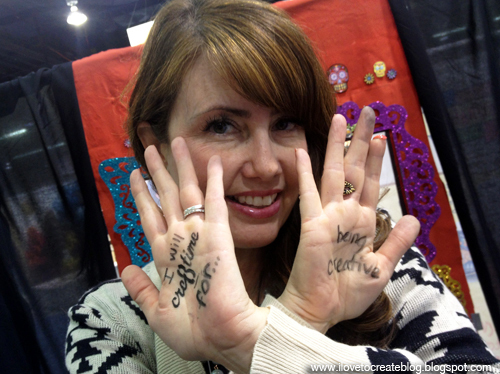 And I loved seeing all of the ideas to bring more creativity into 2013!! I LOVE THIS! You are brilliant! What a creative way to get people inspired and involved! LOVED being a part of this!!!!!!!!!!! It was so much fun and I love that we are a part of inspiring people to Cre8Time!! Btw, that marker did not come off -- but it was an excellent conversation starter all day long. Everyone wanted to know what "notes" I had written on my hand. I so need one of those stencils to use in my classes!!!! What sweet and inspiring pictures! I loved seeing what everyone was inspiring to do to create this year. So fun! !